Sometimes you just wanna hop into a game, solve a few puzzles and hop out without too much of a commitment. Pushmo capitalized on this formula, making you feel like a strategic boss in bite sized chunks on the Nintendo 3DS. 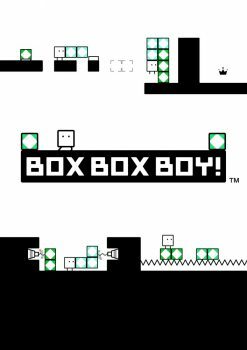 Another title that scratches that same itch is BoxBoxBoy! from HAL Laboratory, although the execution features far fewer frills than Level 5’s lauded digital release. 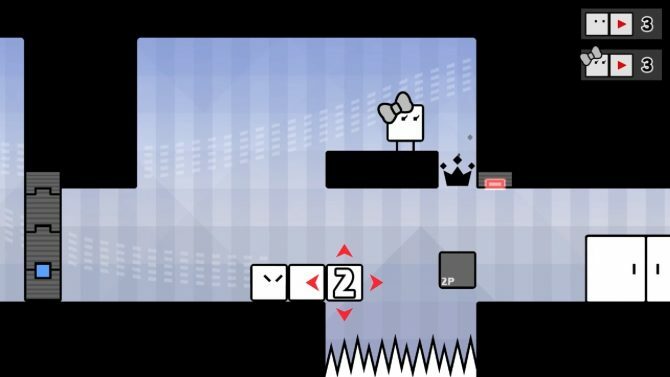 Players take control of Qbby (cubey?) who, for no terribly pressing reason, is tasked with clearing a number of worlds. 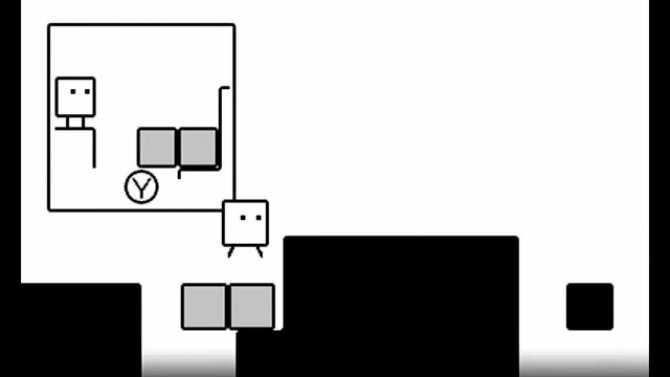 Like all good puzzle games, BoxBoxBoy! revolves around a simple concept. You can produce boxes and you use them to get from one side of a stage to the other. You can stack and push the boxes and arrange them in interesting ways. The challenge comes from various limits placed on how many boxes you can create in different stages. This forces you to think through different ways to proceed. In the beginning stages the game walks you through and explains the mechanics but you’re cut loose pretty briskly. If you get stuck you can purchase a hint for one play coin. I used the feature once to see just what it contained and it isn’t a hint (as advertised) but rather it shows you the solution outright, so only use it if you’re done trying to figure it out yourself. Speaking of figuring it out for yourself, clearing the puzzles is quite rewarding once you’ve experimented for a good while and finally noticed the solution sitting right under your nose. The game rewards clearing stages quickly, promoting replay since you’re unlikely to blaze through each stage the first time. Each level has a crown collectible somewhere within it but the game quickly starts snatching these rewards away if you take too long to pick them up. They are typically placed off the beaten path, so you may spend some time figuring out how to reach a point before restarting the stage and making a mad dash to the crown. 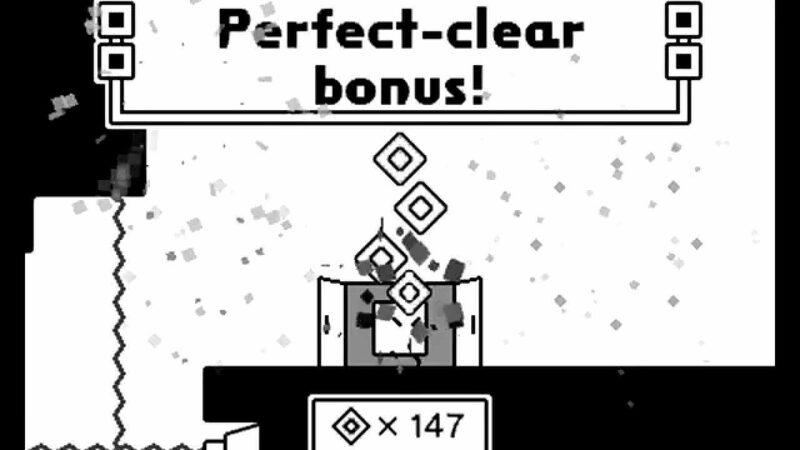 The game values efficiency as well as speed and “wasting” too many boxes will result in a less desirable score. However slowly or wastefully one progresses, the incentive to perform better comes in the form of coins you earn after each stage. Unfortunately these do not culminate in a big motivator because the prizes you can pick from with coins you’ve earned are rather forgettable. All of the costumes need to be purchased from DLC in last year’s BoxBoy! I was able to purchase a ninja band costume with coins I earned but everything else was behind a pay wall. Other items in the store include a few songs you can listen to and brief comics that seem to serve no purpose whatsoever. The comics are a cute distraction but they’re so brief and shallow that they’re hardly compelling after you’ve seen a couple. 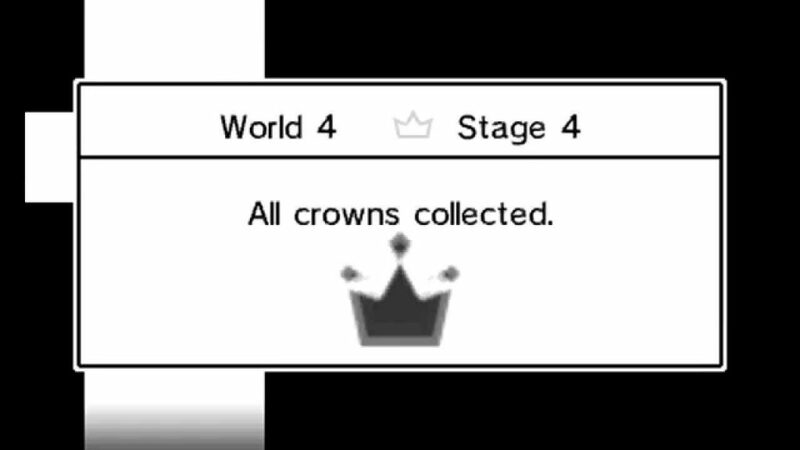 Also, unless you really enjoyed the stage, you might not replay it just to collect the crown because there didn’t seem to be any big reward or motivator for doing so. 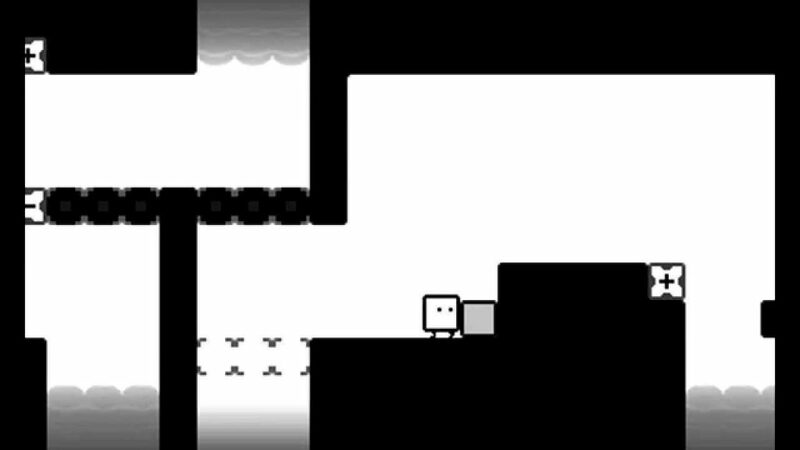 The game’s music is bright and upbeat, coexisting rather oddly with the game’s monochrome visuals. I also didn’t feel that the black and white visuals added too much to the game compared to a title like MadWorld. It seems like it would be far more appealing to the younger players –the demographic it’s more likely to appeal to anyways — if it had went a colorful route like the better Pushmo. The touch screen isn’t implemented very much, nor is there any sort of multi-player or cool AR features or online outside of the Miiverse community. The game is priced to sell at $4.99, but there isn’t a great deal of game here. The puzzles can definitely provide some entertainment and the game succeeds at bringing in new mechanics to keep mixing things up. It really is quite easy to recommend to genre fans, even if it feels a bit barebones in some aspects. The campaign will provide a few hours of enjoyment, depending largely upon how quickly one moves through the stages. I would have liked some multiplayer, even on just a local basis along with some more content. 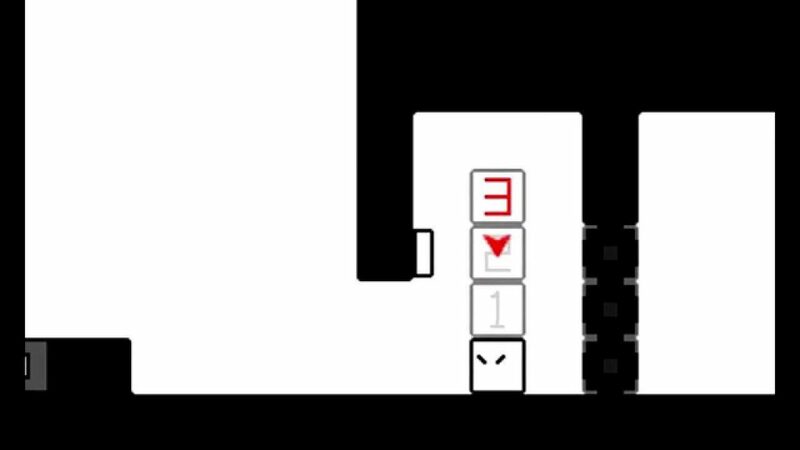 That said it is fun, has some interesting ideas, provides a challenge at times and is surely worth five bucks, especially if you like puzzle games. 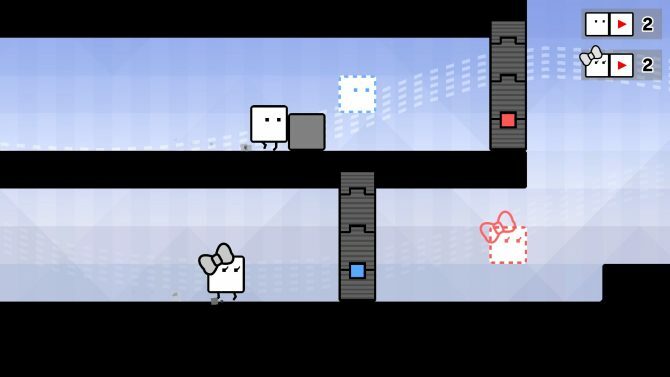 Solving puzzles on the fly with my wife will be a blast with BoxBoy + BoxGirl! The Legacy and History of Nintendo’s Super Smash Bros.